If I were to describe myself, “foodie” would certainly be at the top of the list. I really enjoy good food. Growing up, my parents instilled in me a passion for cooking quality homemade meals and indulging in fine dining. My mom’s life motto which has resonated with me is, “While many people will eat to live, I live to eat.” Thus, studying abroad in Rome for me meant that I had infinite access to Italy’s culinary tradition and explore the realm of heavenly Italian pasta, gelato, and pizza. After celebrating mass at the beautiful Basilica di Santa Maria sopra Minerva, Father Ricardo invited us to lunch at his favorite restaurant Baffetto 2! 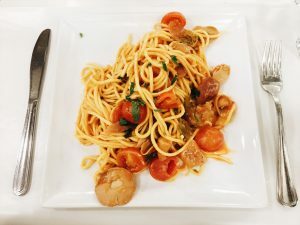 The pasta was incredibly flavorful yet light! I have been in Italy for three weeks and I continue to be blown away by the food here. I have eaten incredible food. I don’t know how else to describe it. It’s incredible. I’ve had carbonara pasta that exploded with delicate truffle oil, savory bacon, creamy egg, and a kick of pepper. Stir-fried, tasteful spicy Thai spaghetti. A medium rare burger topped with zucchini, bacon, a buttered bun, and an egg that oozed golden yolk. Tender egg pasta decorated with sautéed tomatoes, mushrooms, and zucchini flowers. Perfectly round Gnocchi marinated with pesto basil sauce. During almost every meal, I have stopped myself between bites and gasped because I am overwhelmed by the presentation, flavor, and texture. It is almost too good to be true. 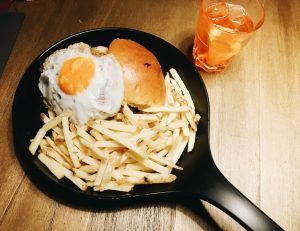 My roommates and I had American cuisine withdrawals three days in so we indulged in a juicy burger and salty fries at T-Bone Station! Many restaurants near John Cabot offer discounts for students! At T-Bone Station, we got 20% off just for showing our IDs! Because Rome is home to thousands of gelateria delivering scoops of classic flavors and whimsical originals, I have consumed copious amounts of gelato. My blood might become melted Italian ice cream. So far, I’ve indulged in coffee, coconut, mandarin orange, and chocolate with rum and raisins. It has been a dream. My favorite gelateria thus far is Gelateria Del Viale, one that is a block away from the John Cabot Tiber campus. Gelato costs usually 2-3 Euros—a cheap, well-deserved after-school snack! 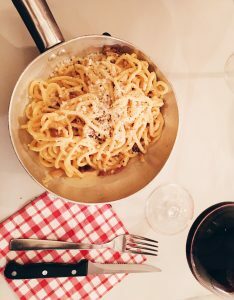 Our first dinner in Rome consisted of savory spaghetti carbonara from Tonnarello! The prices are affordable and the pan presentation of the pasta was tasteful! I highly recommend! While there’s certainly an abundance of tempting gelato around, not all shops are created with natural ingredients. During an Italian food tour provided by SAI, our expert tour guide named Dominique gave us great advice to spot authentic, delicious Italian gelato around Rome. First thing’s first, the gelato should be flat. A display of fluffy, mounted gelato means that the ice cream has probably been whipped with additional chemicals to create air bubbles within it. Additionally, always look at the pistachio flavor because pistachio should be a slight army green. If it is an artificial bright green, consider going to another gelato shop to get your money’s worth. The less flavors in the shop, the better. Shops which have 20+ flavors are less likely to invest in the quality of each flavor. A shop with 10 or so flavors will deliver the richness and creaminess you expect! It is truly la dolce vita when you are enjoying quality Italian gelato! Gelateria del Viale serves endless scopes of joy in the form of gelato! My personal favorites are the tangy raspberry (as pictured) and the coffee! Thus far in my study abroad, I have truly been eating my way through Rome and indulging in all the delightful flavors that this beautiful city has to offer. If you are what you eat, I am complex carbohydrates and I have never been happier! 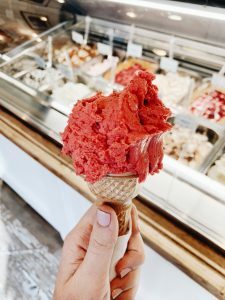 I hope this blog makes you dream of Italian pasta and gelato! If you are craving Asian cuisine, KOI restaurant offers a la carte and unlimited sushi options as well as delivery! 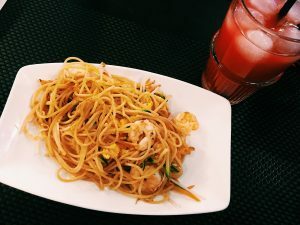 The stir-fried Thai spaghetti hit the spot for me and was extremely affordable! Theresa is a spring 2019 SAI Rome student from Baylor University.